Affascinante: nelle mie letture trovo alberghi dotati di ascensori dello shabbat che incessantemente vanno su e giù fermandosi a ogni piano, in modo da non violare le prescrizioni del sabato. La Halakha (legge ebraica) proibisce al popolo ebraico lo svolgimento di qualsiasi forma di “melacah” (lavoro plurale: melachot) durante lo Shabbat. Le melachot non si riferiscono a quello che viene normalmente considerato lavoro, né coincide con la definizione di lavoro che dà la fisica. Si riferisce, invece, a 39 attività che il Talmud vieta di svolgere durante lo Shabbat agli Ebrei. Numerosi studiosi di Torah hanno osservato che queste attività hanno in comune l’aspetto creativo o l’esercizio del controllo reciproco o dell’ambiente. 39. Trasportare al di fuori della propria abitazione. 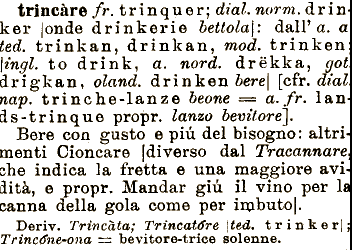 Dell’inglese mi piace questo sprezzo dell’impurità: raccatta su tutto, persino il tedesco, come mostrano le varie parole del giorno del Merriam-Webster. e.g. “Gesundheit!” said the man on the bicycle as he passed a lady on the sidewalk who had sneezed. When English speakers hear “achoo,” they usually respond with either “gesundheit” or “God bless you.” “Gesundheit” was borrowed from German, where it literally means “health”; it was formed by a combination of “gesund” (“healthy”) and “-heit” (“-hood”). Wishing a person good health when they sneezed was believed to forestall the illness that a sneeze often portends. “God bless you” had a similar purpose, albeit with more divine weight to the well-wishing. It was once believed the soul could exit the body during a sneeze, causing ill health, so folks said “God bless you” to ward off this danger. e.g. During the era of prohibition in the United States, when the sale of alcohol was verboten, speakeasies were routinely raided by the authorities and shut down. Despite its spelling, the adjective “verboten” has nothing to do with “verb,” or any of the other words in our language related to the Latin “verbum.” Rather, “verboten” comes from German, which got it from Old High German “farboten,” the past participle of the verb “farbioten,” meaning “to forbid.” (“Forbid” itself derives from Old English “forbēodan,” a relative of “farbioten.”) “Verboten,” which first appeared in English in 1916, is used to describe things that are forbidden according to a law or a highly regarded authority. “Bildungsroman” is the combination of two German words: “Bildung,” meaning “education,” and “Roman,” meaning “novel.” Fittingly, a “bildungsroman” is a novel that deals with the formative years of the main character — in particular, his or her psychological development and moral education. Though the term is primarily applied to novels, in recent years, some English speakers have begun to apply the term to films that deal with a youthful character’s coming-of-age. La parola “educare” viene da ex, fuori, più ducĕre, condurre. Significa, dunque, condurre fuori. Per me l’educazione è un condurre fuori ciò che è già presente nell’anima dell’allieva. Muriel Spark, Gli anni fulgenti di Miss Brodie, trad. Adriana Bottini, Adelphi, Milano 2000, p. 43. Your alter poet is Thomas Stearns Eliot. For you,life rocks pretty hard!